← Power Tool Safety: Is Your Company Up To Standards? Offices should be safe, but risks can be hard to detect. Working in an office environment doesn’t present the same obvious dangers as staffing a factory floor or a construction site. This may lead to complacency on the part of managers. Accidents in the workplace may occur at any time, but they’re especially common when no one has spent time focusing on getting the premises up to standards. To avoid easily preventable workplace accidents, as well as the negative attention of the Occupational Safety and Health Administration (OSHA), it’s important for leaders to figure out the potential hazards lurking in their offices. These can take many forms: from physical features of the environment to gaps in employee knowledge. Performing an honest and thorough search for hidden risks is the first step to creating a compliant and secure office. The following are just a few of the most frequent issues standing in the way of hazard-free work. Leaders trying to improve their conditions can start with these checklist items when performing a comprehensive assessment of their premises. Offices consisting of many computer workstations are common in industries of all kinds. In these types of setups, people stay in one place for hours at a time, and the environmental conditions in those spaces can determine their levels of comfort, health and safety. OSHA indicated that when managers don’t focus on their ventilation systems, they may be creating issues for the workers in their offices. When air conditioning or heating systems aren’t working correctly – or when the components are poorly designed overall – they may pour air directly onto nearby employees. That’s a recipe for discomfort, and if the air pouring from the vents lacks moisture, it can dry out workers’ eyes. OSHA specified air flow rates should be between 3 and 6 inches per second, to make them hard to notice for workers. When workers aren’t taught how to position themselves safely – or aren’t given furniture that helps them stay safe and comfortable – they may suffer health problems. OSHA pointed out musculoskeletal disorders are relatively common – they accounted for 33 percent of employee injuries and illnesses in a Bureau of Labor Statistics survey. Workers who are performing their tasks in unsuitable positions are at severe risk of suffering injuries that range from minor to severe. The agency explained leaders should work with their team members to determine the risks and pain points of working within the office. Once they have a clear and honest picture of the actual conditions faced by their workers, it’s time to develop a response plan. This often involves training. Finding new and more suitable ways to perform repetitive or stressful tasks, and to use specialized equipment, is an essential part of keeping workers as safe and secure as possible. Tripping and falling is an archetypal workplace injury, one that may be associated with busy retail spaces or risk-laden outdoor areas. However, there are plenty of potential hazards in and around standard offices, and managers should be diligent about ensuring their workplaces don’t contain dangerous features. As Safety + Health Magazine recently pointed out, creating a fall-free environment isn’t a one-step process. From cubicle walls that block sight lines around corners to boxes stacked in inconvenient places, there are lots of dangerous features to watch out for. 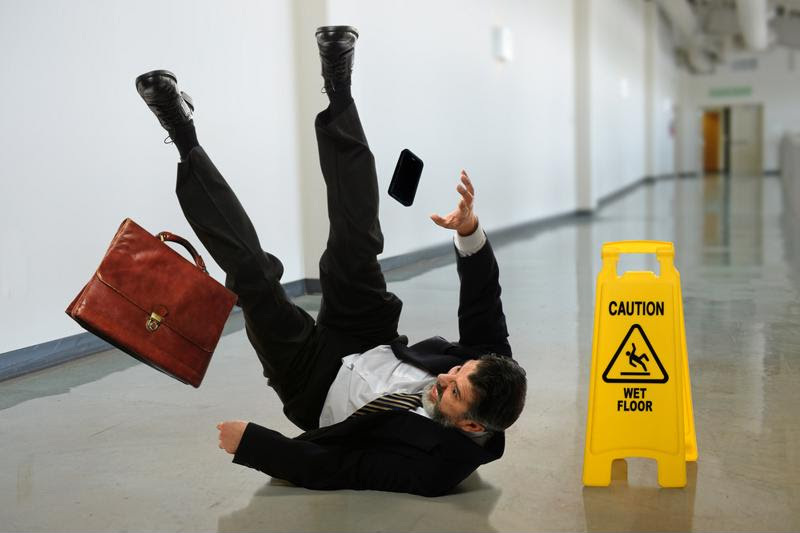 The floor surface present in an office may also be critical to causing or preventing slip and fall injuries. Entrances of buildings can be a hazard, Safety + Health noted, because wet conditions outside can cause workers to come into the office with slippery shoes. Putting down a traction-promoting carpet in the hall could counteract the slick texture and help stop people from falling. Permanent workplace elements such as cubicle walls and flooring materials may be slipping and tripping hazards – items that might strike, hit or catch workers are typically more temporary. Safety + Health warned against the presence of incorrectly assembled stacks of objects, or drawers opened carelessly. Stopping these dangers is a mix of diligent inspections by managers and proper training by workers. When professionals know the proper way to stack up and store goods – and when not to make a stack at all – they run significantly reduced risk of creating a striking hazard. This is the kind of subject that improves with training and employee education. Assuming that office workers understand how to keep their spaces safe may lead to problems down the line, as it’s easy and costly to make a mistake. When setting up a warehouse, preparing a construction team or staffing a chemical manufacturing plant, the need for environmental safety preparedness is obvious. Everyday, relatively simple and secure workplaces such as offices also require such preparation. If managers only get serious about office safety once an accident has occurred, it’s too late. Preparing in advance is clearly a better practice. This entry was posted in OSHA and tagged employee development, office safety, OSHA, Safety Training. Bookmark the permalink.